As the home of inventor Dean Kamen, for Bedford to field anything less than one of the top robot building teams in the state would be a crime. So, it's no surprise that Bedford fielded three. Three Bedford teams ­ one from McKelvie Middle School and two independent teams ­ competed on Dec. 13 in Nashua at the FIRST Lego League state tournament. FIRST is a competition in which high school students from across the nation compete to build, program and operate a robot which will carry out a series of complex tasks. The Lego League is the junior level competition in which elementary and middle school students construct the robots out of Lego building blocks. The competition was founded by Dean Kamen, and this year, the New Hampshire competitions were sponsored by BAE Aerospace in Nashua. FIRST place ­ A team of homeschoolers from Bedford, Hollis, Merrimack, Milford, and Wilton took top honors at the FIRST Lego League state tournament last Saturday Dec.13, at Nashua High School North. 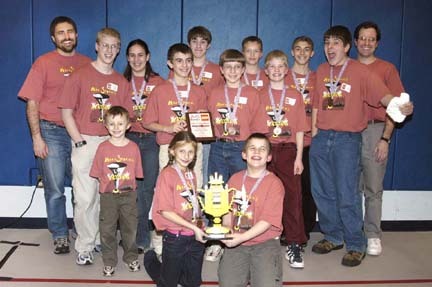 Team Mindstorms Mayhem competed against 47 other teams from around the state to build and program a robot to solve nine missions. They'll go on to the national contest in April. Team members pictured are (front row, from left) David Gray (Junior Team Member), Melissa Gray and Dan Umenhofe In back are coach Bill Gray, mentor Christopher Jennings, Vickie Umenhofer, Jacob Krupkin, Brian Jennings, Nathan Streeter, Nathan Gray, David Schunemann, Ben Krupkin, Ben Streeter and coach Ken Streeter. This year's theme was "Mission Mars," in which teams had to construct and program a robot to carry out specific tasks on an imaginary Martian surface. In addition, each team was required to research a certain aspect of Mars exploration and then develop a presentation. The Mindstorms Mayhem team from Bedford ­ made up of home-schooled students from Bedford and several other nearby towns ­ pulled in the prestigious Director's Award at this year's state competition. The award is given to the team who captures top honors in the fields judged. The team also placed third in robot performance and has earned the right to represent New Hampshire at the national competition in April. McKelvie Middle School also sponsored a team, culled from eight in-school teams, which, unfortunately, ran into technical problems the day of the competition. "We had some glitches that day," said Roger Steines, the team's coach. "Some unfortunate things that always happen when you have so many variables in play did happen." At the competition, the slight problems McKelvie was running into seemed to do nothing to dampen the team's enthusiasm for the project. Crowding around their robot to show its various parts and what task they accomplished, the seven teammates talked energetically about the project. "It's fun. It sort of gives us a head start," said Adam Hickman. Hickman and several of his teammates said the competition had sparked an interest in engineering and computer science for them. At the next team pit station over, students from the other independent Bedford team ­ The Munchkins ­ bubbled with similar enthusiasm. The Munchkins, sponsored by Dean Kamen's Deka Research company, was made up of a mix of McKelvie students and homeschoolers. Stephanie Schaeberle, a seventh-grader at McKelvie, spoke at length about the types of subjects she and her teammates researched in preparation. "We had to research about rovers going to Mars," she explained. "How they get stuck ­ what we would do." Schaeberle and her teammate's research and hard work apparently paid off as the team captured second place statewide in the programming part of the competition. This kind of enthusiastic response ­ about the robots, the research and the possibilities of a future career planning mission to Mars ­ is exactly what many parents and educators are looking for. Nancy Streeter, mother of two Bedford home-schoolers on the Mindstorm Mayhem team, said she thought the competition was invaluable for students to get involved with. "It's great especially for home schoolers to work together with other students in a team environment," she said. This sentiment was echoed by McKelvie coach Steines. "I think (the competition) does a lot of things. For one, it has the individuals working as a group," he said. "And in the real world, where they may not see themselves right now, they'll be working in groups always." Streeter also said that the competition was an excellent way for parents and educators to introduce students to subjects they may not necessarily get. "It's also wonderful for me to have my boys learning other topics I don't necessarily know a lot about," she said, citing the programming aspects as an example. Streeter said it's fantastic that the program was getting students motivated to research and learn. "The research aspects of the program are wonderful. It's not just building a mechanically sound robot, it's also researching and being able to present your findings," she said. "They've used the Internet and e-mailed scientists to research." "It's really been very good for inspiring research. Kids aren't always motivated to do that," she said. "So, its nice to find a context where they're excited about that." All content on this Web page is property of Neighborhood News and should be not reproduced without permission.